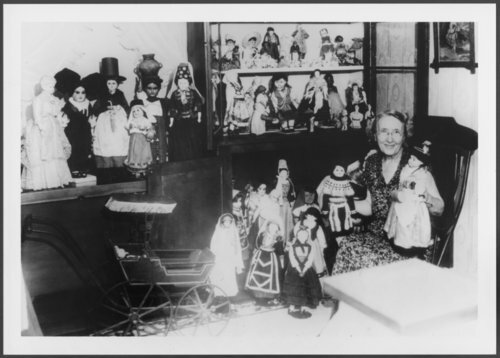 This is a photograph showing Lida Ann Beaty Pearce Jackson with her collection of dolls. In 1882, her family came to Kansas from Tipton County, Indiana and settled in Linn County and then Stafford County. In 1885, the family eventually settled in Hodgeman County, where they lived for seven years until drought forced them to leave. She lived in Oswatomie where she met and married Herbert Pearce, a newspaperman, on July 19, 1904. When he died in 1907, Lida moved to Irvington, Indiana. She met and married Ed Jackson in 1920. He was an attorney and in 1924 he served for four years as Indiana governor. Lida eventually took up a hobby of dressing dolls to match portrayals of European ladies found in the National Geographic magazine. She accumulated about 80 dolls, which are visible in this photograph. After her death, her daughters Jo and Margaret, gave the dolls as a memorial to their mother to the Children's Hospital, James Whitcomb Hospital, Indianapolis, IN.